As we were driving past Cornavin Station a few weeks ago, my boys screamed with excitement at the sight of a beautiful 1930s historical tram taking a tour of the city. To be honest, I was just as disappointed as they were that we couldn’t just drop our car and jump on board ! 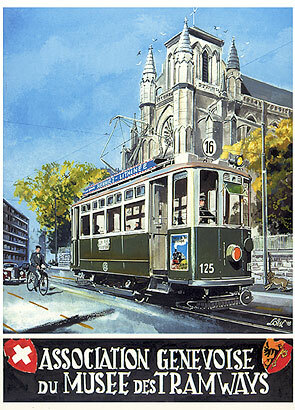 The good news is that the Association Genevoise du Musée des Tramways (AGMT) has organized a fantastic historical trams festival for Sunday 4th of November 2012 to celebrate 150 years of public trams service in Geneva, so we’ll definitely be ready for that. The Festival tramways historiques 2012 will start at 10am on Sunday 4th of November 2012 and finish at 5pm. Visitors will be able to board some beautifully restored, brightly coloured beauties from the 1910s, 1920s and 1950s and travel various routes across town such as Rive – Nations, Rive – Gare Cornavin, Rive – Acacias – Carouge and Rive – Plainpalais – Moillesulaz. Click here to see the exact times and routes. The festival is affordable too, with all-day “libre parcours” tickets priced at just 10CHF. This promises to be a day-out the whole family will love ! Click here to see more photos and historical images of Geneva’s dashing period trams.